Marc Marquez has secured his fifth MotoGP title after taking an eighth victory of the 2018 season in the Japanese Grand Prix. Honda rider Marquez started only sixth at Motegi, but carved his way up to second on the opening lap before engaging in a nailbiting duel with Andrea Dovizioso. He grabbed the lead on the 21st lap of 24 with a bold pass at Turn 9, but Dovizioso stuck to his tail and looked poised to fight back until the Italian lost the front end of his Ducati at Turn 10 on the penultimate lap and slid into the gravel. That left Marquez with a clear run to victory, with Honda stablemate Cal Crutchlow moving up to second as a result of Dovizioso's demise ahead of Suzuki rider Alex Rins. 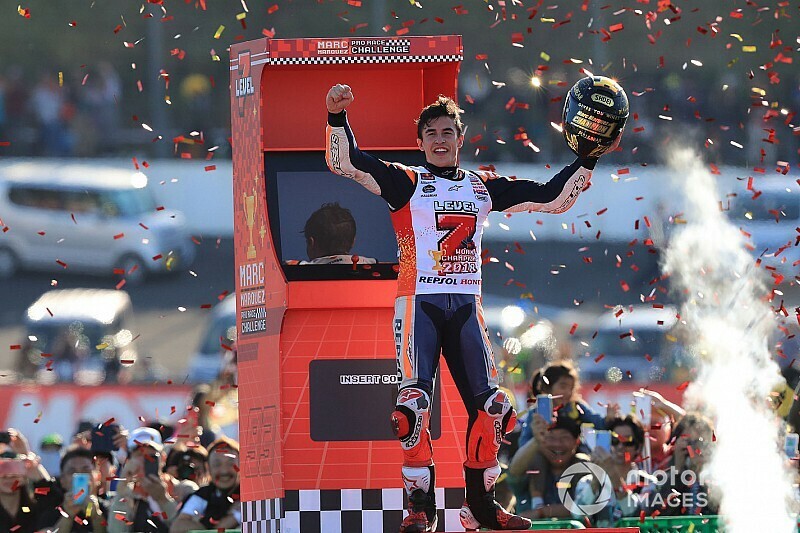 Marquez’s fifth premier class championship moves him level with Mick Doohan, with only Valentino Rossi (seven) and Giacomo Agostini (eight) having scored more. The 25-year-old also becomes the youngest rider to ever reach the milestone, eclipsing Rossi, who was 26 when he scored his fifth straight 500cc/MotoGP title in 2005. 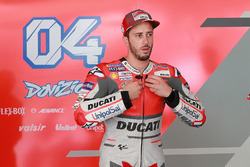 Dovizioso had controlled almost all of the race up until his crash, converting pole into an early lead as fellow front-row starters Johann Zarco and Jack Miller nearly came to blows on the run down to the first turn. Miller nonetheless hung on to second as Marquez gained three places to run third, before inevitably passing the Pramac Ducati rider for second at Turn 9 later on the opening lap. Once second, Marquez opted to run at a conservative pace behind Dovizioso as a pack of riders formed up behind. However, only Crutchlow had the pace to run with the two title protagonists, with the three riders beginning to edge away from the rest of the pack at one-third distance. Marquez waited until lap 14 to make his first move, passing Dovizioso at Turn 9, but one corner later he ran wide on the dirt and lost drive - with his rival almost piling into the back of him, and repassing for the lead. Dovizioso pushed again on lap 18 with a new fastest lap, but Marquez went even quicker the following lap and it became clear the Spaniard was in no mood to settle for a safe second, which would not have been enough for the title. 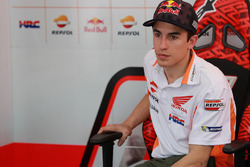 Once Marquez passed on lap 21, Dovizioso kept close and the pair were running nose-to-tail at the time of the crash that settled the championship in favour of the Honda rider on the Japanese manufacturer's home turf. Crutchlow had already lost touch with the lead pair by this point, and was forced to turn his attention to fend off Rins, whose teammate Andrea Iannone had crashed out of contention at Turn 10 on lap 19. Ultimately the Briton hung on to the place by just a tenth of a second, finishing 1.5s down on Marquez. Valentino Rossi was fourth on the best of the Yamahas, a further five seconds down, having dropped behind both Suzuki riders in the early stages. Alvaro Bautista made steady progress from 11th on the grid to match his best result of 2018 with fifth on the Nieto Ducati - helped by fellow GP16 user Miller crashing out of seventh at half-distance. Zarco never recovered from his bad start and wound up sixth on the Tech 3 Yamaha, while Maverick Vinales was seventh after dropping outside of the top 10 at one point. Rounding out the top 10 were Dani Pedrosa (Honda), Danilo Petrucci (Pramac Ducati) and Hafizh Syahrin (Tech 3), who passed the lead KTM of Bradley Smith for the place. Smith slipped a further place behind the Marc VDS Honda of Franco Morbidelli to finish 12th ahead of teammate Pol Espargaro, while home riders Katsuyuki Nakasuga and Takaaki Nakagami completed the scorers. Dovizioso remounted after his crash and finished 18th.